"This is a great option to a traditional lettuce salad. It is filling and good for you! You can substitute ranch dressing for different dressing of your choice." Bring water and quinoa to a boil in a saucepan. Reduce heat to medium-low, cover, and simmer until quinoa is tender and water has been absorbed, 15 to 20 minutes. Remove from heat, uncover and allow to cool, about 30 minutes. 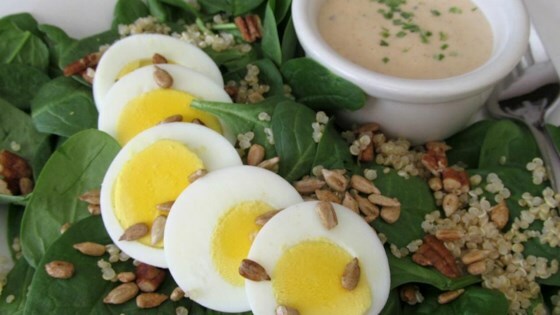 Toss quinoa, spinach, hard-boiled eggs, walnuts, and sunflower seeds in a large bowl until combined. Top with ranch dressing. This is a good and healthy basic salad. I didnt have any walnuts on hand so I substituted pecans but otherwise I followed the recipe.